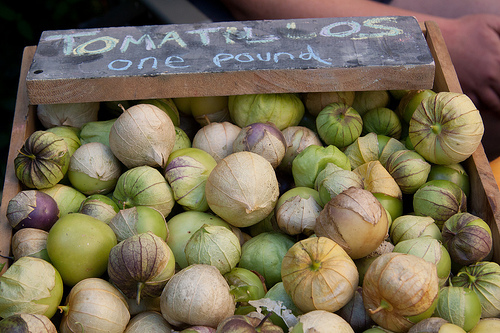 Tomatillos are in season now! These little green tomatoes are perfect for a summer fiesta, and especially delicious blended into a refreshing salsa verde. Add your salsa to tacos, enchiladas, chips, meats or fish. Tomatillo’s are filled with antioxidants, are great for eye health, and contain important minerals like copper, iron, phosphorous and manganese. 1. Prep: Remove the husks and rinse well. Prep your onion, cilantro, lime juice and jalapeños. 2. Cook or not: You can cook the tomatoes in 3 different ways – roasting, searing, boiling. Or you can blend them up raw. If you decide to cook them, chose a method that will work best for you. If you are roasting, simply cut them in half, place the cut side down on an oiled baking sheet and roast for 5-7 minutes until golden. If you are searing, add oil to a pan, and sear them on each side for 5-7 minutes. If you are boiling, place them into your pot and let boil for 5 minutes, until soft. 3. Blend: Place tomatillos, lime juice, onions, cilantro and jalapeños in a food processor until finely chopped. Season to taste with salt, and let cool in your fridge.